"All the Way to the Top"
For the first thirteen issues, Velvet is a taught espionage story that feels self-contained within its own world. This changes in Velvet #14 with the presence of former President (and current President during the time of the story) Richard Nixon at the center of the issue. It’s a bold move by writer Ed Brubaker and artist Steve Epting that is not without its potential problems. On a larger scale, though, Velvet #14 starts making reveals about what happened to X-14, the agent that Velvet Templeton has been accused of killing. This plot ties into the inclusion of Nixon as well. SPOILERS to follow. Velvet Templeton has been either on the run away from ARC-7 or chasing directly after them, following the murder of Agent X-14, for which she was framed. Recently, she encountered nemesis Damian Lake, who has been a real wildcard in the whole mystery. Gradually, Velvet starts to figure out that X-14’s death has something to do with a cover-up at the Watergate Hotel – and that’s where Nixon comes in. Velvet doesn’t do baby-steps here; she goes right out and kidnaps President Nixon and then drugs him with some sort of truth serum. She gets her answers (though readers aren’t shown what Nixon tells Velvet). This puts her in an uncomfortable mood and she is soon – perhaps intentionally – caught by ARC-7. Within the progression of the story, bringing Nixon into the narrative makes sense. You could argue whether Nixon himself needed to be in the story. He is really more of a plot device than a character, which is kind of an odd role for a serving U.S. President to play. In some ways, the Watergate controversy is the pinnacle of 1970’s disillusionment, which is why it works so well for conspiracy-thriller stories of the time (or set in the time). However, I also feel like the Watergate/Nixon connection is maybe too much of an easy target. At this point, it feels more like a symbol and signifier of government corruption and conspiracy than an actual event. 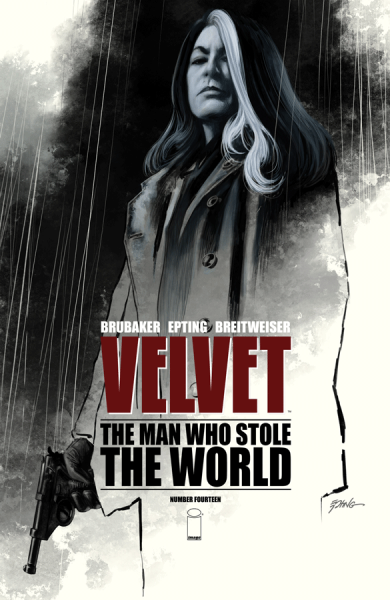 I’m still intrigued by the story present in Velvet #14 and the series overall, but I think this may be a time when having fictional characters connect to historical events (and vice versa) doesn’t entirely serve the story. There is also a moment when Velvet advises Nixon, who is still feeling the truth serum effects, to stay secluded because “You’re a Crook.” This seems to be a bit heavy-handed, since the shorthand for Nixon in Cliff Notes history is that dubious “I’m not a crook” line. I don’t really get the point of inserting the line into a subtly-written story such as Velvet. Velvet kidnapping Nixon also involves getting then-Vice President Gerald Ford to taint Nixon’s Scotch so that he gets ill enough for Velvet to get him alone and take him. It's a pretty crazy moment. Having future President Ford be an accessory to kidnapping is a story beat so bananas that I kind of love it. 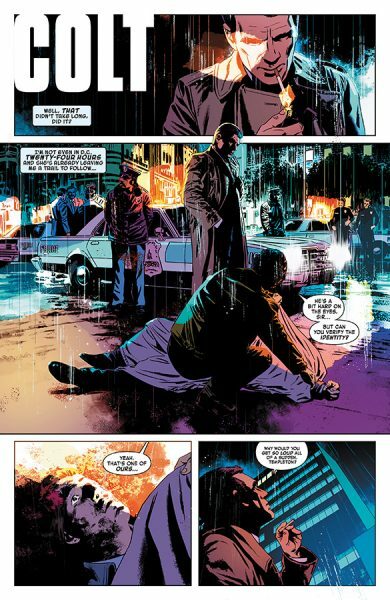 Velvet #14 does have another over-the-top moment, when it is revealed at the end of the issue that the Director of ARC-7, who has previously shown murdered, is actually alive. You can practically hear the “dun-dun-duuun” music when he is shown on the last page. That this character is still alive makes some sense because thrillers often have twists and turns as well as characters become something they weren’t. 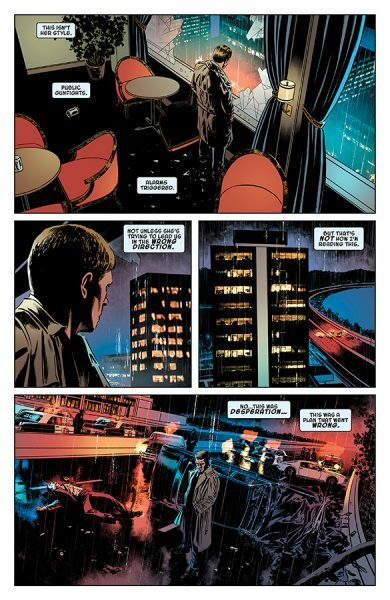 It does feel like there is a small change of tone in Velvet #14 with the resurrection of the Director and the kidnapping of Nixon. The story has more surprise moments than in previous issues and feels a little less small-scale realistic. 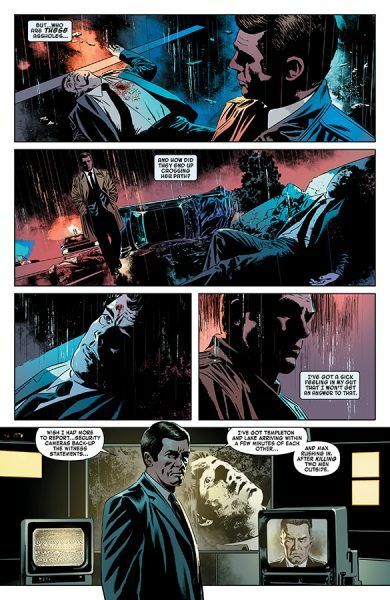 In cinematic terms, previous issues of the series felt more like a Friedkin or Lumet thriller and Velvet #14 feels more like a Hitchcock thriller (there's nothing wrong with that). However, it does feel a bit jarring compared to other issues. Velvet continues to be a compelling protagonist and Colt, the ARC-7 agent that is now chasing her (and who is starting to sympathize with her position), forms a nice counterpart. Although Damian Lake is not in this issue, his anarchic presence still hovers over it. The return of the Director, whom I suspect is not quite as benevolent as he has appeared in early parts of the series, also throws another strong character dynamic into the mix. Overall, I think the series becomes even more tense following Velvet #14. The art of Steve Epting and coloring of Elizabeth Breitweiser continues to shine (though since this is a dark story, “shine” is probably not the most accurate word…). Epting nails his depictions of Ford and Nixon to an uncanny level. Furthermore, he really shows the dejection and pain on Velvet’s face after she has been told what Nixon knows. For her part, Breitwesier provides a dark and smoky quality to her colors that makes much of the issue feel like some sort of dream. Velvet #14 is a sort of strange issue in some regards. It’s an enjoyable read and it definitely sets up future issues with some exciting new dynamics. The choice made here to include Nixon in the flesh is bold, and I respect that the creative team went for something so risky. Nixon’s presence, though, takes me a little out of Velvet’s story, and I think could make the conspiracy at the center of the story too linked to the Watergate cover-up. So there are some thematic and tone quibbles I have, but Velvet #14 is still an intriguing and significant issue.